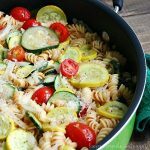 This One Pot Summer Vegetable Pasta is a quick and easy summer dinner recipe that uses fresh summer vegetables like tomatoes, summer squash and zucchini. Add olive oil and onions to a 12 inch skillet and cook over medium high heat until softened. Add the box of pasta, zucchini, yellow squash, tomatoes, and basil to the skillet. Pour 3 cups of cold water and salt into the pan ensuring that the water covers the pasta (it does not have to cover the vegetables). Turn the heat up to high and cook for 10 minutes, stirring regularly, until the water is absorbed. With about 1 minute left add the sauce then remove the skillet from heat and top with cheese. Serve immediately.